The very heart-beat of music is Laya. Rhythm in Carnatic music is accorded a very high status as is evident from the Sanskrit maxim, "Layah pita", meaning, Rhythm is the Father. We shall now explore the different facets of rhythm in Carnatic music. Rhythm is omnipresent. There is rhythm in the movement of heavenly bodies just as in the life cycles of micro organisms. It is only natural that man is endowed with it. 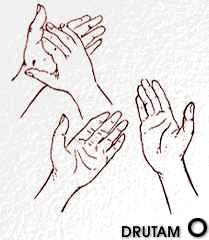 Whenever we listen to music, we look for the rhythmic movements in it and then find ourselves tapping our feet or clapping our hands or even dancing to it. But what exactly do we mean by rhythm? Rhythm can be defined as a process in which the nuclei of attention are separated by individual parts of time. Whenever we listen to music, we cannot but perceive rhythm. Rhythm gives stability and form to music. It can be described as the tangible gait of any musical movement. In Carnatic music, this is referred to as Laya. 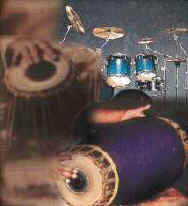 The common fallacy is that rhythm or laya is confined to percussion instruments and the rhythmic patterns produced therein. But laya is not limited to just that. It is present not only in melodic compositions, which usually have a rhythmic metre in an apparent manner but also in the creative aspects, sometimes conspicuously (like in Neraval or Kalpanaswara) and subtly at others (Raga alapana and Tanam). The rhythmic aspects in Carnatic music are arguably among the most developed and sophisticated across the world. The patterns range from the simple to the complex. The study of rhythmic aspects involves understanding the terms Tala and Laya. Tala is often confused with Laya. Laya refers to the inherent rhythm in anything. Irrespective of whether it is demonstrated or not, it is always present. This can be better illustrated with an example. We know that the sun, the planets and other heavenly bodies are moving objects. Even as our earth rotates on its axis and revolves around the sun, these bodies have their own fixed movements and speeds. Even a microscopic disturbance in that speed may lead to disasters of huge proportions. So laya can be explained as the primordial orderliness of movements. Expression of laya in an organised fashion through fixed time cycles is known as Tala. Thus it serves as the structured rhythmic meter to measure musical time-intervals. 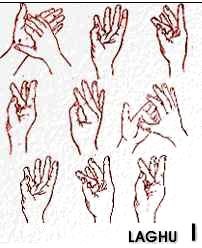 Tala in Carnatic music is usually expressed physically by the musician through accented beats and unaccented finger counts or a wave of the hand. In other words, Tala is but a mere scale taken for the sake of convenience. Anudrutam - a beat, represented by the symbol "U". This is physically represented as 1 unit. Drutam - a beat and a wave of the hand, represented by the symbol "O". This is physically represented as 2 units. Chaturasra (Jaati) laghu has a beat plus 3 finger counts, which is a total of 4 units. Tisra (Jaati) laghu has 3 units i.e. a beat plus 2 finger counts. Misra (Jaati) laghu has 7 units, i.e. a beat plus six finger counts. Khanda (Jaati) laghu has 5 units, i.e. a beat plus four finger counts. Sankeerna (Jaati) laghu has 9 units, i.e. beat plus eight finger counts. 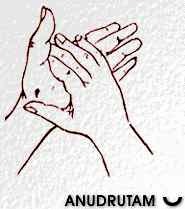 To render Misra and Sankeerna laghu, one comes back to the little finger after exhausting the fingers while counting up to 6. The remaining 3 angas, namely Guru (8 units), Plutam (12 units) and Kakapadam (16 units) are not frequently used in the talas generally used in the concerts. These talas find greater use in the ancient tala system. In the present day context, they figure in thematic programmes or Pallavi demonstrations. An example of a tala that uses all the parts mentioned so far is Simhanandana tala, the longest tala, with 128 units. Talas make the counting of larger meters (some of them beyond a hundred units) easier. The audience also gets an opportunity to participate more actively in the concert when they maintain tala along with the performers.